Iowa Boaters Meet Low-Head Dams: What is a drowning machine? An article in the Business Record discussing low-head dams caught my eye and with May beginng the season for boating on rivers in Iowa boat owners need to refresh or even learn about the dangers of being pulled over a low-head dam. We strongly suggest that if you are going to boat on one of Iowa’s rivers that you learn about low-head dams and then about the locations of any low-head dams on the river before you drop the boat in the water. This warning is for not just motorboats, it includes paddlers. 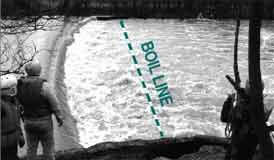 What is a boil line? See the photograph. It is the width of circulating water turning on the downside side of the river of the damn. What is a drowning machine? From the Virginia Department of Game and Inland Fisheries we have his definition. “Lowhead dams are deceptively dangerous and merit the name given to them, "drowning machines." Virginia has several of these killers on rivers throughout the state. Over the years, houseboats, fishing vessels, powerboats, sailboats, PWC, and canoes have all fallen victim to lowhead dams.” See also the Minnesota DNR’s safety sheet on low-head dams. The Virginia site has a concise list of dangers and safety tips. Dams are difficult to spot from upstream and often are not marked by signs or buoys. Dams can deceive even experienced boaters. The concrete walls at the side of the dam face block the exit route for individuals trying to escape. Areas immediately downstream also present risk as the water is flowing upstream. Rescuing trapped individuals is dangerous and often unsuccessful. Scout the river and know the location of hazards. Talk with boaters who are familiar with the river to gain additional knowledge. Boat with experienced, responsible boaters and learn from them. Watch for a smooth horizon line where the stream meets the sky. This potentially indicates the presence of a dam. Look out for concrete retaining walls which are part of the dam structure and easier to spot. When portaging, re-enter the river at a point well downstream of the boil. It is nearly impossible to escape the strength of the hydraulic when trapped. The best thing to do if in this situation is to tuck the chin down, draw the knees up to the chest with arms wrapped around them. Hopefully, conditions will be such that the current will push the victim along the bed of the river until swept beyond the boil line and released by the hydraulic. Researchers said low-head dams now serve little purpose, but are a threat to swimmers, boaters and others swept into the churning water they create. Researchers say that since the 1950s, more than 400 people have died at 235 so-called low-head dams in 38 states, including Iowa. About half of those deaths occurred in the past 15 years as more people spend time on rivers. The dams, typically built in the early 1900s, can look harmless, but once people fall into the roiling water, they can be trapped by a wave of water forcing them to the bottom. The dams no longer generate electricity, but many residents like them because they create a wide, smooth waterway that's an attractive backdrop for a revived downtown. If you, your spouse or a member of your family or friends are involved in any kind of accident contact the Lombardi Law Firm. We can assist you with handling your legal claim. Steve Lombardi has more than 30 years of experience in civil litigation including death and injury cases for workers and their spouses from as many ways as people can get injured or killed including boating accidents. We work with lawyers all over the State of Iowa on a frequent basis. We don't charge you to talk with Mr. Lombardi to find out if you have a case. We work on a contingent fee agreement. Don't delay, call us today.